When many of today’s teachers who grew up in Generation X are asked to reflect on traditional learning objects from their classrooms of the 1980’s and 1990’s, they think of paper, pencils, chalkboards, and textbooks. When they're shown a series of pictures of those classroom’s from the '70s, '80s, and '90s, and asked to describe them, they use adjectives like "utilitarian, boring, and two-dimensional." The classrooms in which Millennials and Generation Z learn are a world apart from those of Baby Boomers and Generation X. In 2014, using augmented reality as a launching pad into discovery is becoming more common. Gone are the direct instructions of “sit down and be quiet” or “take out your textbooks and turn to page 21.” The modern classroom makes use of Augmented Reality to curate the web for this generation of digital natives. These days, students can walk into a classroom and use their tablet or smartphone as the AR device to trigger to original content made on movie-making software and posted to YouTube, leading to an immediate and immersive learning experience. Even the sound of learning has changed in today's classrooms, from the vocal command of the teacher directing students toward the sound of students working together in groups, or listening to audio or visual content on their devices through their ear phones. “Kids are actively doing rather than passively listening," says Jeff Gorman, Assistant Superintendent of Schools in Monroe Township, New Jersey, and a frequent observer of these forward-looking classrooms. "The question is no longer what did the teacher teach today, the question is now what interesting question did you explore in school. This indicates a shift in learning towards higher level thinking skills." Meg Wilson, Technology Integration Specialist at Avenues: The World Schools in New York City, says using AR her in classroom adds another dimension to learning. 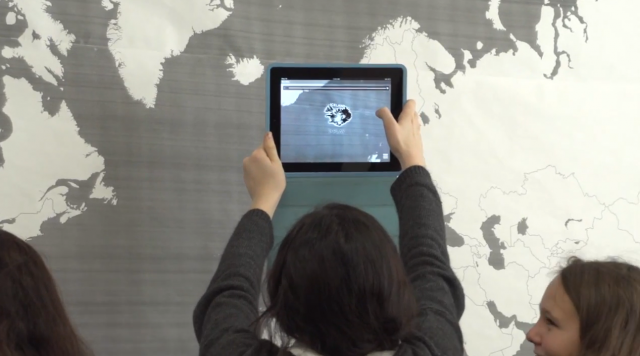 “Layering digital content over our physical spaces has allowed Avenues to redefine the learning experience, as it provides students opportunities to create and explore multi-media content in a way that is both engaging and active,” as illustrated by the video of their AR Map below. By now, many people have heard of, if not actually seen people wearing Google Glass, and more and more teachers are beta-testing in their classrooms. More important than the actual device itself is the cultural shift in learning patterns that they're accelerating. Observing the tactile changes within the “glassroom," students are moving away from the tablets' “touch, swipe, double tap” to interacting with content through voice and head motions. Florida science educator, Adam Winkle, and EduGlasses are developing an app called Edustream that will control the computer, sync to Google Drive on the glasses, and allow the wearer to access documents, hands-free, in the classroom. This application will let the teacher move freely around the room and project content to a class without being chained to the front or having their hands full with a device. The wink of an eye, the simple one-finger tactile swipe down -- these are the sights, sounds, and kinesthetic gestures that are changing the context of modern learning. While we do not know what the devices of the future will look like, we do not know that innovation in education does not have a fixed audio, visual, or tactile prescription for all learners. The advent of tablets, augmented reality, and wearable tech makes the shape of knowledge completely malleable. Courtney Pepe is a high school teacher in Monroe Township, New Jersey. She will be presenting on her experiences with Google Glass, iPads, and Augmented Reality at the July 28-30 EdTechTeacher Summit in Chicago.